One of the most “Googled” terms this week will be 2019 Masters Sleepers or Masters Longshots. If you're playing in anyof the Top 2019 Masters Fantasy Golf Contests or are in a Masters office pool, then these sleeper picks are a necessity in order to dominate the competition! Below, we break down some of the info that the pros look at for choosing sleeper picks and we even give you our top three 2019 Masters Sleepers for you to consider. 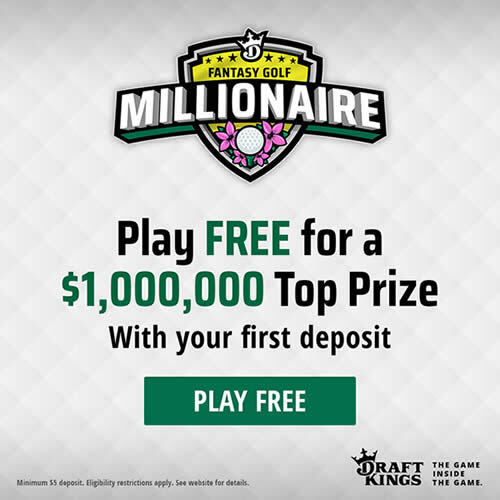 Use our sleepers or pick your own to play FREE for a top prize of $1M in the $4,000,000 Fantasy Golf Millionaire at DraftKings. Score a FREE ENTRY by making any deposit of $5 or more ($20 value), then choose just 6 golfers and watch and win! Here are our top three Masters sleepers for 2019. After his win at the WGC - Dell Technologies Match Play he is a steal at $6,700 for the Fantasy Golf Millionaire at DraftKings . Kisner has been trending upwards since last year's 2nd place finish at the Open Championship and 12th place finish at the PGA Championship and he walks into Augusta with a good record while on a hot streak that makes him a great Masters Sleeper Pick! Snedeker has come really close a few times to winning the Masters, but lately injuries and age have started taking over. His history at the Masters is solid though, with three Top 10 finishes in his career. Snedeker didn't get an invite last year and will be hungry to play at Augusta once again. Don't let his age be a factor in whether to use him as a sleeper or not as old guys seem to play well at Augusta and it's not unique that one of them wins and puts on the Green Jacket. We had Hoffman as a sleeper pick last year and he finished in a tie for 12th. Hoffman has never finished worse that 29th at Augusta. I like Hoffman's course history at Augusta and some guys really step up their game for certain tournaments. We will have Hoffman in a bunch of our fantasy golf lineups because he will be a low cost at every fantasy golf site. For MORE great picks and complete Masters analysis check out GolfStats.com! 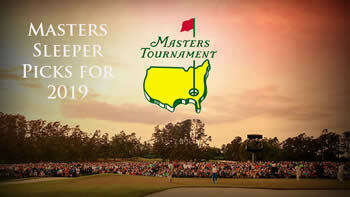 Don't forget to check out our Masters Tournament Preview to get more info for the 2019 Masters at Augusta. Course History – It's Augusta! – The most famous course in the US and one of the most well known golf courses in the world. Most players have played there numerous times unless they are new invites to the Masters. That being said, there are some golfers that just have no luck at Augusta and some that always make the cut and play well. Look at the course history and see who loves playing there and who will have their plane ticket booked for Saturday. Play the Hot Hand – Because so many players will already be familiar with playing Augusta, we love using golfers that are hot leading up to the Masters. Guys that are making cuts, finishing in Top 25’s and in the two weeks before the Masters are flirting with wins are great sleeper picks that aren’t necessarily going to be priced high when the rankings come out on Monday. What are the Odds? – Here is a link to the Odds for the 2019 Masters. The guys that set up fantasy golf salary cap numbers aren’t as smart as the professional odds makers so you will find some top golfers are given 40-1 to 80-1 odds but are a low salary cap number. It’s a good reference point when you like a certain player to see where the pros think he stacks up. How's the Weather? – Normally the Masters has picture perfect weather but occasionally a hot spell dries up the course or the rains come through and change how the balls bounce. Knowing which PGA Tour Golfers have a good short game to take advantage of wet conditions, and which golfers are the long hitters that will take advantage of the dry conditions can help you build a lineup that suits how the weather will affect the 2019 Masters Tournament.